Don’t worry, I’m not talking about guns or weapons here! I’m talking about having a load of toys and food for your child ready to go. Keeping your child busy is the key. Your child will go from activity to activity, and you don’t want crying to be one of those. Eating as many healthy snacks during a flight is a good thing. Keeps their jaw moving and earways clear. On one of our first flights with E, she tore up all the magazines and duty free books she could. We quickly learned that you need to have way more stimulation for your child on a flight and expecting them to sit in one chair for such a long time without that is a recipe for disaster. Of course you want your child to sleep for the entire flight. But, that’s just not possible. So, the key is to have him or her sleep at the best time. And that depends on when and where you are going and the meal time. For most international flights meal time comes about an hour or so after take off. This is a loud time where the lights are on and people are moving. So, this is a perfect time to bring out that arsenal of toys and activities. Trying to force your child to sleep is a recipe for disaster. Keeping your child relaxed and happy is key. Colouring and reading will make your child content and eventually tired. Before you child turns 2, their ticket is basically free. However, they won’t have a seat of their own. 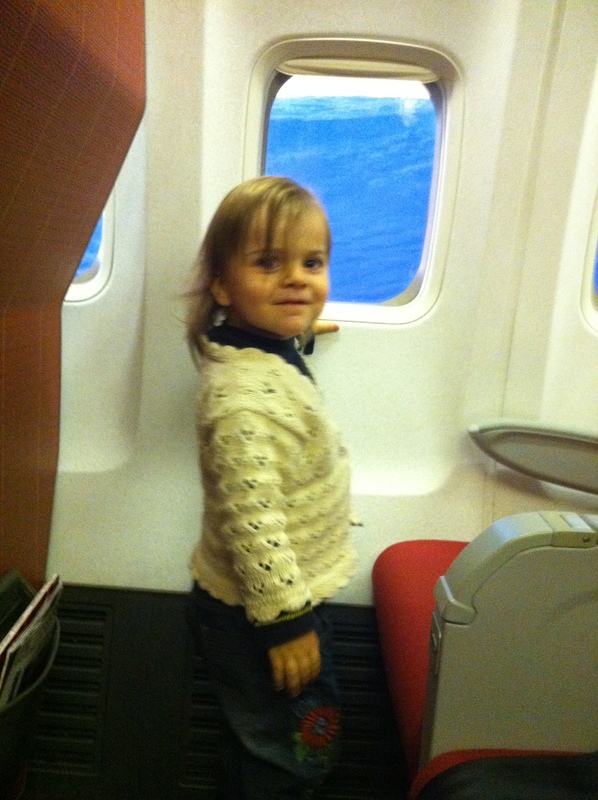 As our daughter turned 2, she became more and more restless on flights and really liked to move around. I’m a big guy already, and I find seats in the economy section very tight. Add a 2 year old in your small space and it’s really tricky. So we came up with a plan that really can’t backfire. What’s the worst seat on a plane? The middle seat of course. What we would do is reserve the aisle and window seat, leaving the middle seat empty. Solo middle seats are always the last to be booked. And what if it gets booked? In that case, of course the person sitting in that seat would change with either your aisle or window seat. So no harm done! Or, the person will change to another middle seat in a different location. It’s amazing how many times we ended up with all three seats to ourselves. Traveling can be a very stressful and unenjoyable experience. This preholiday experience can actually ruin your entire holiday. The key is teamwork. Flying with your family requires extra patience and consideration. It’s so important to share responsibilities. Take over when the other is exhausted or out of tricks. Alternate sleeping times and most importantly put the highest emphasis on remaining cool and calm. Roll with the punches and enjoy it. You are going on a holiday after all! I hope this can be a help to you during your travels. I’d love to hear your thoughts in the comments section below and if you know anyone who this info might help, please share. This entry was posted on January 15, 2014 by theguestroom in myHK and tagged kids, toddler, traveling.